You asked for it...so we made it! A larger version of our Bunny-N-Clyde Hideout. 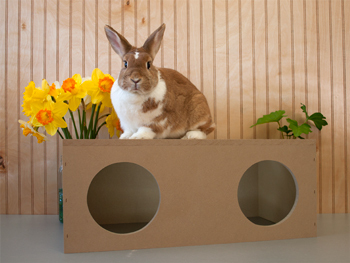 This pet hangout is 21 inches long by 11 3/4 inches deep by 8 1/2 inches tall. It has two doorways and plenty of room for all kinds of pet parties. Holes are 5 1/2 inches in diameter. It is four walls and a top...there is NO bottom in our hideouts to make it easy to clean.